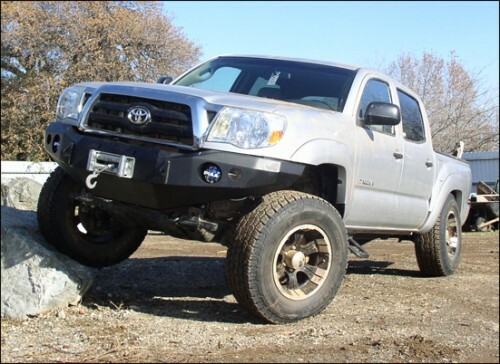 In part one of our short series on aftermarket steel bumpers for the Toyota Tacoma we discussed some of the benefits of installing a steel bumper on your Tacoma. Let’s take a look at a few of the options that are currently out there on the bumper market from a variety of different manufacturers. 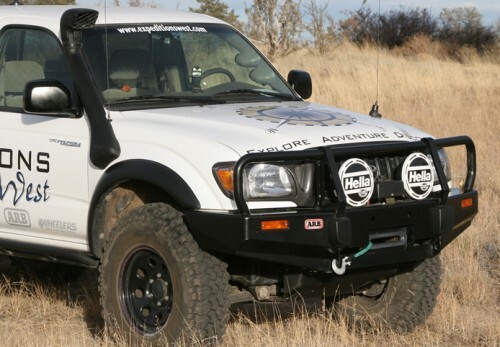 In our introductory bumper post we included a picture of an Expeditions West truck with an ARB Deluxe Bull Bar installed on the front. The Deluxe model is cut from a single piece of steel, is stress-tested to guarantee safe winch mounting, offers secure positions for adding off-road lights and also provides recessed light openings to protect fog lights. Pricing for the ARB Deluxe Bull Bar is in the $700 to $950 range. 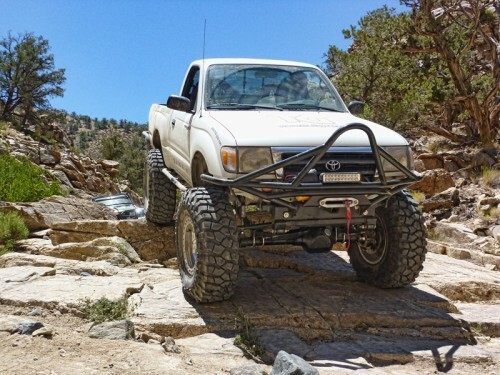 The All-Pro Off Road bumper for the Tacoma adopts more of a desert-runner style as seen by the acute angles and swept side wings that are meant to reduce the truck’s overhangs and provide excellent clearance whether you are leaping over dunes or climbing across a field of boulders. The modular bumper (ships in four pieces) is also offered with an optional light bar, and features room for an integrated winch. Pricing for the bumper is around $900, but shipping adds another $250 to that amount. Relentless Fabrication makes hand-built custom front and rear steel bumpers for the 2005+ Tacoma. Special thanks to BlueTacoMan for bringing this to our attention! 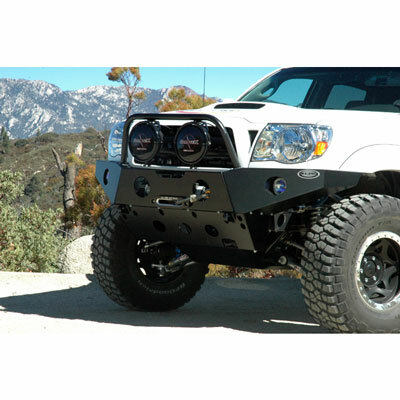 Road Armor provides one of the most stock-looking off-road steel bumpers on the market. The Stealth bumper comes in three different versions: base, Pre-Runner and Full Guard. The Stealth base bumper offers a much more subtle wrap-around than other aftermarket options which still providing room for winch mounts and protecting the front of the truck from serious damage. The Pre-Runner features a more prominent, bulging style while the Full Guard model comes with a form-fitting steel tube cage to protect the light and grille surrounds. Road Armor also offers a Stealth base bumper for the rear of the Tacoma. Pricing for front bumpers starts at $1,440.31, while the rear unit is available for $1,196.25. Trail-Gear Rock Defense bumpers provide aggressive-looking protection for both the front and the rear of the Tacoma. These bolt-on steel bumpers fit without the need for any welding or cutting, and they feature winch mounts and anchor points for vehicle recovery. Trail-Gear also offers a set of Low Profile bumpers that offer undercarriage protection with more subdued styling. Pricing begins at a very affordable $419 for the front and $289 for the rear. 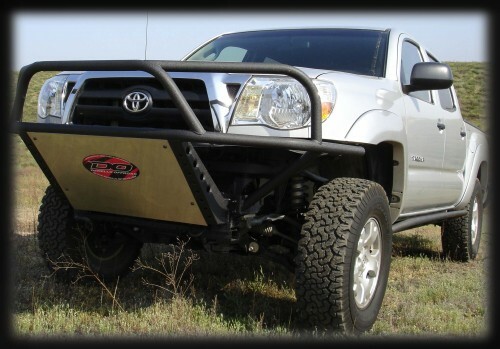 Demello Off-Road bumper – custom only. Demello Off-Road doesn’t provide much information about its Tacoma bumper offerings, but the company does state that it will built any custom bumper that is needed for a specific task. Pricing is dependent on the style of bumper selected. Do you know of a steel bumper that’s not listed here? Please tell us about it in the comments below. 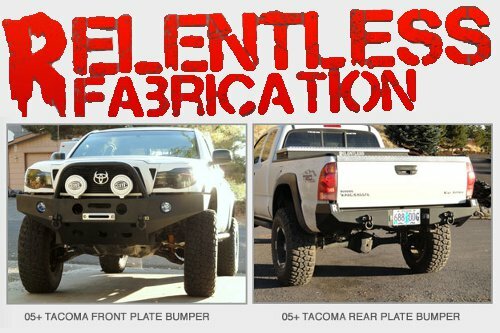 Check out the custom fabrication of Tacoma steel bumpers by Relentless Fabrication http://www.relentlessfabrication.com/home.html Of course they do more than just bumper and more than just Tacomas. But I know he owns a nice Tacoma!! BlueTacoMan – Thanks for the link! I added it to our list. Thanks! That’s a great link. That (road armor bumper) is not road armor. It’s made by a company in redding, ca. Company called winch ready. Much better to deal with than road armor. Cheaper too. I got front and rear bumpers for my Nissan Titan built by them. Outstanding work and customer service. James – Thanks for the tip. Does Road Armor “white label” WinchReady.com’s bumpers? I ask because Road Armor would seem to be the manufacturer based on their website…not disagreeing with you, just trying to figure out what’s up. I thought that the bumper was road armor. Well it looks like it is made from a different manufacturer because of the way it looks. The bumper is made to not fall off any time soon unless it gets cut up real bad. Getting new bumpers for your car is a good deal because you can lower your prices on cheap rates. I know that it takes time to find better customer service out there. A company very worth mention is Addicted Offroad in Ft. Collins, CO. I did a ton of research on bumpers for about a year before I decided on their tube/plate hybrid bumper. It is similar to the trail gear bumper, but with a square “stinger” option for those of us that don’t want the big pointed stinger. My bumper looks and performs great. They come with options for light mounting brackets and led turn signal kits. I have a pair of 6″ KC lights and a warn m8000 winch on mine. It all fits perfectly with no grill trimming. Lighter and cheaper than the full plate style bumpers, but has a solid plate “shelf” that the winch mounts on connected to a plate for the fairlead mount, and a plate that angles down at about 45 degrees to the mounting point on the frame. It also comes with a fram reinforcement kit that is a super stout box that welds over the end of the frame rails, boxing the frame and adding a lot of strength. The bumper bolts onto that box. Best value and best looking, in my opinion. They’re made to order, so don’t expect a quick turnaround. Mine took 2 months to get to me, but was well worth the wait. Thay just added a full plate “ARB” style bumper to their lineup for December. Check it out. Support small businesses!